Home » Glamorous life in 1850. Fashions under the Restoration. Glamorous life in 1850. Fashions under the Restoration. Echoes of Bon Ton. MESDAMES the Parisians were all on a footing of war from the commencement of the year of grace 1850; the Prince President had substituted for his ordinary Thursday receptions veritable little dancing fêtes, for which Strauss and his orchestra had been ordered to the orangery of the Élysée. High spirits, youth, laughter were everywhere in these kinds of redoubts so little redoubtable, where people quoted among the queens of elegance the Princesses Mathilde and Caroline Murat, the Marchioness of Castelbajac, ambassadress to St. Petersburg”, Madame de Polignac, Mademoiselle de Lovenheim, the Baroness Pasquier, the Countess Regnault de Saint-Jean d’Angely, and a hundred other charming women who took pleasure in rivalling one another in graces, and in fencing matches of toilets and of diamonds, of garlands and of flowers. Never were seen more naked shoulders than at this hour which marked the middle of the century, never perhaps more fresh or more white complexions of women shone under the flame of the lustres. 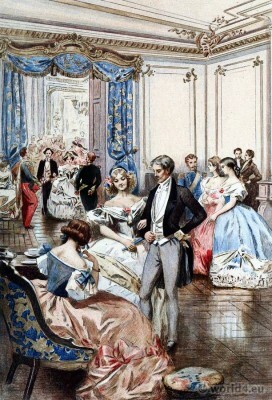 All Paris danced and was now nothing more than a grand ball; the journals of fashion present us only with evening dresses and magnificent toilets; blond, moire antique, rose and blue crape, satin and velvet are put to contribution by all the dressmakers of the capital to create master-works of a charm not to be forgotten. With her hair crisped or with virgin frontlets, armed with branches of bindweed or garlands of foliage, and roses rolled amidst the hair like Roman fillets, or again coifed with blond or lace, with a small delicate cap coquettishly ribboned, light as a breath of morning, the Frenchwoman of 1850 appears to us as an exquisite creature, with fine, long, and delicate form, like those statues of Pradier which personify her. One imagines her sweetly dreaming in this romantic sunset of art and romance, of which the last rays settle upon her large luminous forehead with, as it were, a mysterious languor in the caress of her regard. One finds in the Bernerette the “fair angel” of the poet, the Métella, set in relief by the Baroness Dudevant, the enveloping muse, in short, of that admirable legion of artists and literary men who then flourished in France as in a veritable Athenian republic. 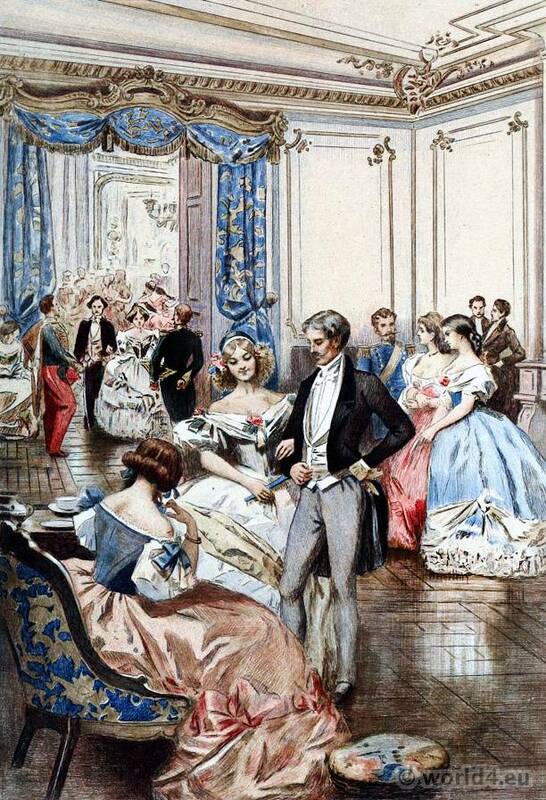 From Chapter: Echoes of Bon Ton and of the life of fashion in 1850: The Frenchwoman of the century; Fashions – Manners – Usages, by Octave Uzanne. Illustrations in water colours by Albert Lynch. Engraved in colours by Eugène Gaujean. This entry was posted in 1850, 19th Century, France, Restoration and tagged France restoration costumes, Octave Uzanne on 8/23/14 by world4.